BetOnline still has one Super Bowl LIII prop bet listed on their site, and it will be taken off the board tonight at 7:00 p.m. ET. After doing some digging on Reddit, the way it works is you bet up to $50 now and when the 2019 NFL season rolls around, you’re essentially guaranteed to win an equal amount up to $50. That’s a nice gift for anyone wanting to start betting when the NFL kicks off next season. Dave Mason of BetOnline confirmed the “Easiest Bet Ever” on Twitter earlier this week. 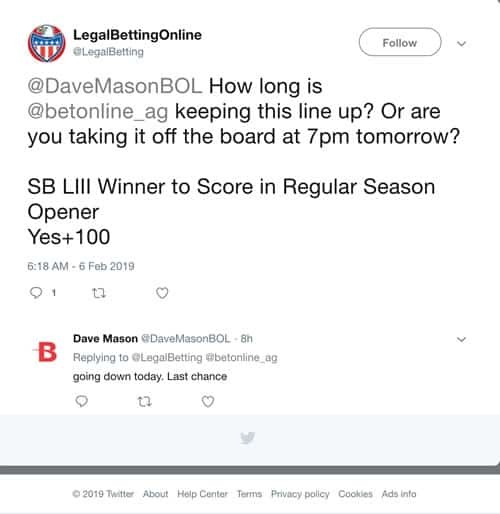 We reached out to Dave Mason to ask how long BetOnline was keeping the prop bet up, and he confirmed that it was coming down today at 7:00 p.m. ET. Check the box next to +100, then select “Straight Bet” on the right side of the page and then bet up to $50. And that’s it. 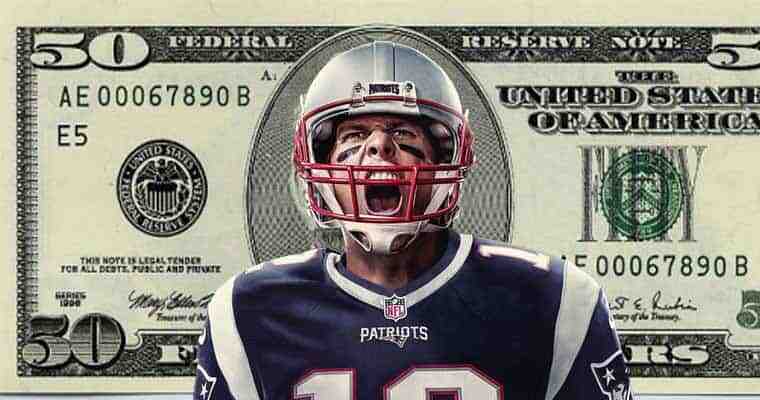 You’re all set to win $50 when the New England Patriots score any points during their first regular season game of 2019. As we now know, the Patriots won Super Bowl LIII this past Sunday, defeating the Los Angeles Rams by a score of 13-3 in the lowest scoring Super Bowl in history. Now, the odds of the Super Bowl LIII champion Patriots scoring any points in the 2019 opener are much higher than 50%, and it’s probably safe to say they are much closer to 99.9999999999999% give or take a few decimal places. The last time the Patriots were shut out was a 16-0 defeat to the Bills in 2016, but that was with Tom Brady serving the final game of his 4-game suspension handed out by judge, jury, and executioner Roger Goodell. With Brady under center, the Patriots have only laid a goose egg twice in his entire career, 31-0 to the Bills in 2003 and 21-0 to the Dolphins in 2006. However, both of those games were on the road. When Brady is on the field, the Patriots have never been shut out at home — which is where they’ll likely be playing for their 2019 opener like Super Bowl champions have done.